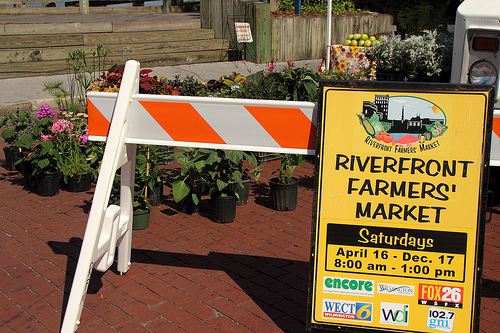 Yesterday a friend and I visited the riverfront farmers' market in downtown Wilmington, North Carolina. We got there late. It was hot. People were walking away carrying armfuls of flowers, lugging showy striped watermelons, tugging tired children out of the street. We worried about the dog's paws and looked for shade under the vendors' tents. We passed tables of summer vegetables, racks of flowy clothes, scented soaps and lotions, a knife sharpener, bakers, potters and a pickle makers, a woman selling mussel pearl jewelry, an dog biscuit duo giving away samples and profit. We bought some kombucha. Fell for the child who asked, Can I pet your dog? At the end of the market, just before we turned to go back, I saw the one thing I hadn't expected to see: a car just like his. Yellow-and-black like a wasp and I was stung. I gasped and cried out, reflexively turning away to face the water. My friend put her arm around me. The tears did all the talking. A car just like his. It would have made me smile when he was still here. But of course, impossibly, he isn't.